For this video and the related videos, please follow the links at my webpage “Six:Catalunya”. For a Dutch translation, see the parallel post on this weblog. The Catalan Question and International Law. Conference on the Right of Self-Determination, The Hague, The Netherlands, 9 November 2018. An international symposium organised by ANC Nederland. Afred De Zayas. Professor of international law, writer, historian and a leading expert in the field of human rights and international law. Formerly UN Special Rapporteur on the Promotion of a Democratic and Equitable International Order. 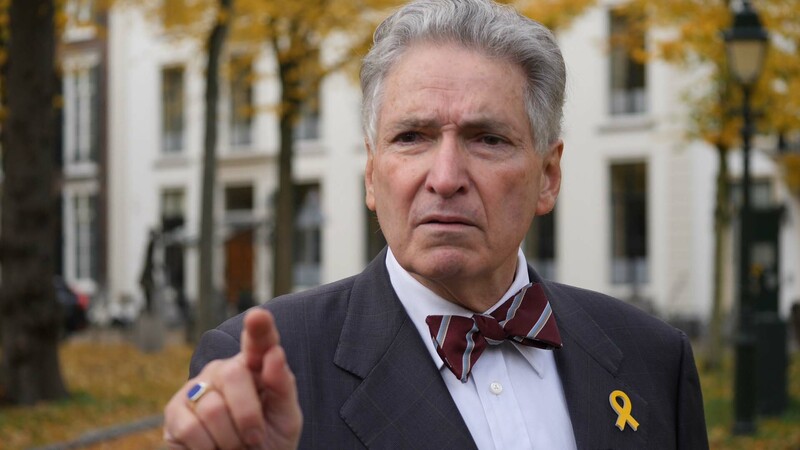 My name is Alfred De Zayas. I am the former United Nations independent expert on the Promotion of a Democratic and Equitable International Order. I served six years, from 2012 to 2018. I presented fourteen reports to the General Assembly and to the Human Rights Council. And one of those reports, the 2014 report, is devoted entirely to the theory and practice of the right of self-determination. Before that, I have been professor at numerous universities, in Canada, in the United States, in Germany, in Spain. And I was the secretary of the United Nations Human Rights Committee. And the chief of the petitions department in the office of the UN High Commisioner for Human Rights. – The Spanish State (judiciary and executive) rejects the validity of the 1 October 2017 referendum on the independence of Catalonia, claiming that is was “illegal”. What is your opinion on this? Well, governments, politicians, journalists can say whatever they want. A professor of international law will tell you that the right to decide, the right to express your desire for self-determination, whether it be internal or external self-determination, is a fundamental human right. Now, you have article 1 of the Covenant on Civil and Political Rights, article 1 of the Covenant on Economic, Social and Civil Rights, not without reason. The drafters of the two covenants placed self-determination as the principle first right. As you know, human rights are universal, interrelated, and interdependent. So, if you violate the right of self-determination, almost inevitably you are going to be violating a host of other human rights. Certainly, if a population wants to hold a referendum: thát expression of their wishes is protected by article 19 of the Covenant on Civil and Political Rights. It is also protected by the European Convention on Human Rights. That doesn’t mean that, by virtue of that referendum, you are going to obtain greater autonomy, or you are going to obtain secession, independence. One thing is holding the referendum. Another thing is: what are the consequences thereof. That must be according to the rule of law. That must go through a certain process. And the process must conform with international law, must conform with human rights law, must conform with the Covenant on Civil and Political Rights, etcetera. But to claim that a referendum is “illegal” is absolute nonsense. – Nevertheless, the Spanish judiciary and government maintain that the referendum was illegal and a host of people are being prosecuted for their involvement. Well, the fact that there are political prisoners in Spain is really scandalous. And the fact that the European Commission in Brussels and the European Parliament has not clearly condemned this is also a scandal. They have actually become complicit in a very grave violation of international law, and of human rights law and in particular article 9 of the Covenant on Civil and Political Rights. These persons who are currently in jail in Spain: their only offence is the excercise of a ius cogens right, to wit, the excercise of the right of freedom of expression in order to achieve a referendum and to achieve what every people is entitled to. Article 1 of the Covenant on Civil and Political Rights says: all peoples…. It doesn’t say “some peoples”, it doesn’t say “peoples who have been under colonial rule” have a right to self-determination. All peoples have that right. And my colleague at the University of Geneva, professor Nicholas Levrat, who is the head of the international law department at the university of Geneva, he published a book last year called “The Right to Decide”, which, better than anybody else, has explained the parameters of the right of self-determination, in particular in the case of Catalonia. – “All peoples have the right to self-determination”. But what constitutes “a people”? There is no agreed definition of a people. In an article that I published some years ago and also in my 2014 report to the General Assembly, I go into the various definitions of what constitutes a people. Probably the most widely accepted definition is what is termed “the Kirby-definition”. Kirby was an Australian judge and he argued objective and subjective elements of a people. Obviously, the objective elements are common history, common culture, language, ethnic group, what you want. But also there is a subjective element of “identification”. When you have all those elements together you have “a people” . And these persons, who belong to this people, do have a right to determine their future. That’s what self-determination means. They can decide not only whether they have a status of autonomy, or of federalism, or of independence but also the kind of government and the kind of education that they want to give to their children. So a… the definition of a people is not something that is an impediment to the appplication of article 1 of the Covenant. I mean, I have no difficulty in stating, as professor of International Law, that the Catalan people are a people. And not only the population of Catalonia, those who today reside in Catalonia, but all those who identify themselves with the Catalan language, with the Catalan history, and with the Catalan culture. – About the added subjective element of the wish to be identified as a people and the consciousness of being a people: is this compatible with the concept of “civic” nationalism? Not sure what you imply by “civic nationalism”. We are all Europeans. And we are all bound by the European Convention on Human Rights. There is, shall we say, equality in dignity, equality in rights, and you can be, simultaneously, a patriotic Catalan and a patriotic Spaniard. But the civilised thing to do, first of all is to just sit down and discuss. See what are the options. I could see very well, if Spain were to modify its constitution to make Spain into a federal state – there are plenty of examples in the world of that – in which each federal state has a large measure of autonomy, including fiscal autonomy, which is very important: not only education, and not only relations with other states or other entities… but fiscal autonomy. That is a model that can be discussed. But what you cannot do is adamantly and intransiently say “no, the constitution forbids that”. The constitution, the Spanish constitution, pursuant to article 10 paragraph 2 and article 96 of the Spanish Constitution, incorporates the international human rights treaty regime into Spanish Law. Including article 1 of the Covenant on Civil and Political Rights. 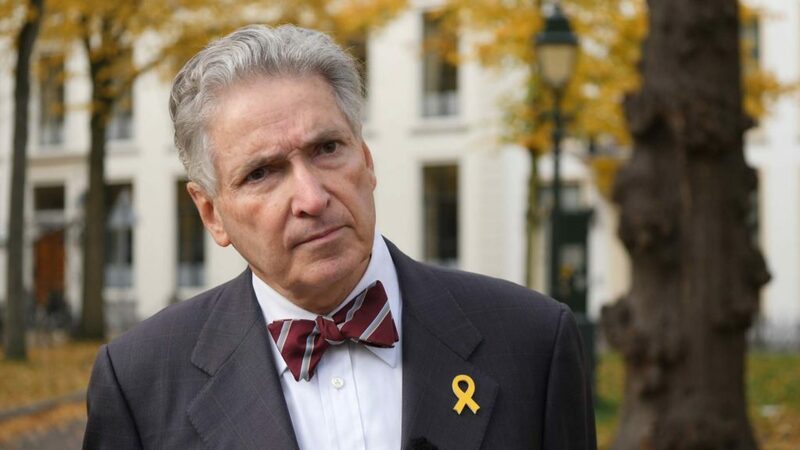 So, it is fatuous of Spanish professors to say, that the Spanish constitution forbids a referendum or that the Spanish constitution does not recognise self-determination – of course it does! And the question is: how are you going to apply it in a way that is peaceful and democratic. – How could Catalan self-determination be achieved in practical and political terms? In a civilised situation, you are going to have negociations between those who want internal self-determination and those who would prefer external. What is particularly shocking is that the desire for self-determination, the expression of self-determination, has been criminalised and that politicians who have advocated self-determination have been either driven into exile or have been imprisoned. Just imagine what the reaction of the world would have been if the independentists of Scotland had been jailed by the United Kingdom. Or if the independentistst in Quebec had been jailed by Canada. It’s simply outrageous, outrageous that there are political prisoners in Europe, namely in Spain, and that the European Commission is not doing anything about it. The European Commission likes to micro-manage states. They get into the affairs of Poland, and into the affairs of Slovakia, the affairs of Czech Republic, the affairs of Poland, they cry foul because of threats or so-called threats to the rule of law in Poland or the rule of law in Hungary. And they are completely silent about what’s going on in Spain which is many times worse. What does that tell me? International law is applied à la carte, is being applied arbitrarily. And what consequences derive from that? The credibility of the European Union. The credibility of the European Commission. The credibility of the European Parliament is at stake. It’s not just the breakdown of the rule of law in Spain. It is the breakdown of the credibility of the organisation that should safeguard and guarantee the human rights of all Europeans, including the Catalans. As I say, there are a whole host of arbitrary moments here. It’s an arbitrary application of international law and of human rights law and also an arbitrary focussing on certain countries like Hungary. It is politically correct to criticise Victor Orban, but it is not politically correct to criticise prime minister Sanchez for instance. So there are here differences that cannot be rationally explained. What I’d like to say in this context of selectivity is that Europeans, especially the big powers, are concerned about the precedent that the independence of Catalonia could mean for them. The French are worried about the Bretons, and they worry about the Corsicans. The Italians may be worried that Veneto wants to separate. Or that the Lombards would want to separate, or that the Germans of the southern Tirol want to separate. The Belgians and the “Flamands” might want to split. And I say, if they want to separate, is it not more civilised to have a friendly divorce? In 1993, the Czechs and the Slovaks went seperate ways and they have been perfectly functioning, democratic societies, democratic governmenst since 1993. There is no problem. Now, the Catalans are 7,5 million people. According to the Montevideo Convention, the elements of statehood are: a population; a territory; a government – 131 presidents of the “Generalitat”; and, of course, relations with other international entities. Catalonia has it all. And it is a viable potential state, with 7,5 million people, with a vigorous industry and with a very, shall we say, efflorescent population. It would be a perfectly functioning independent country in the European Union. But it’s the precedent value that is here at stake and the Europeans, in particular the French, are afraid. – How authorative or immutable is a constitution if it turns out that parts of it may be at odds with International Law? Well, there is no constitution that is written in stone. I mean all constitutions are subject to modification. And in the case of Catalonia and in the case of self-determination, you really do not have to amend the constitution, because pursuant to these two articles I have already mentioned, 10 paragraph 2 and 96, self-determination is part of the Spanish legal order, is part of the legal order of every country in the European Union. So, if the Catalans want to hold the referendum and if the Catalans want independence, they have the right to have it. Now, there is a tendency in the public toward “status quo” – leave things the way they are, don’t rock the boat. Now this tendency to a form of conservatism can be modulated, can be mellowed, with a little bit of good will and a little bit of cooperation from the media. I have found that the reports on Catalonia in El País, in El Mundo, in the ABC, in Le Monde in France, in Le Figaro, in the NZZ [Neue Zürcher Zeitung] in Switzerland, in the Weltwoche etcetera, has been quite biased, quite one-sided. And it has not served the interests of the Spanish, of the Catalans, or in general of the Europeans. I keep saying: the Catalans are Europeans. They are good Europeans. They believe in human rights and they have given the world an example of how you can democratically and peacefully demand your right to self-determination. Unfortunately it’s being suppressed and unfortunately for whatever, probably geo-economic reasons, it’s being “freiné”, it’s being stopped, it’s being slowed down, because certain interests are worried that maybe there might be unforeseable economic consequences. – On the progressive development of the right of self-determination, the concept of territorial integrity and the right of secession. In 2014, I presented a report to the General Assembly [of the United Nations], a report devoted entirely to the doctrine of self-determination and to the experience of the international community in handling it. Now, what is important to understand is that international law is not static. International law is dynamic, it’s always progressing. And there are certain things that have occurred since 1945 that have seen the right of self-determination evolve. We are not at the stage of de-colonisation, we are not at the stage of 1960, 1965, 1970, etcetera. We are in the 21st century, 2018. We have seen the dissolution of the Soviet Union into 15 republics. We have seen the dissolution of Yugoslavia into seven state entities. And we have had jurisprudence. Among that jurisprudence, most importantly, is the advisory opinion of the International Court of Justice, 2010, on the unilateral declaration of independence by Kosovo. It is not so much the fact that a unilateral declaration of independence does not violate international law, that is pretty obvious. So, I mean, that is not the crux of the matter. That is not where the focus should be. The focus should be: where are the obstacles to obtaining self-determination? And then Spain will tell you: “ah, territorial integrity!” And they’ll say: “the principle of territorial integrity is absolute!” It isn’t. It has never been absolute. But then the International Court of Justice put this question to rest. It answered the question. Is territorial integrity somehow hierarchically more important than self-determination? Answer: no. And then the International Court of Justice goes beyond. It says: in the United Nations Charter, article 2, article 4, in resolution 2625, in resolution 3314, in the Vienna Declaration and Programme of Action, in the Millennium Declaration. Even the OSCE in the Helsinki Declaration of 1975. Whenever the principle of territorial integrity is invoked, it is invoked in the context of inter-state relations. Meaning: state A cannot encroach on the territorial integrity of state B; state A cannot occupy the territory of state B; state A cannot aggress state B. Never, néver is the principle of territorial integrity to be used internally, because that would immediately nullify the right of self-determination and it would nullify the right of the Slovenes to their independence and would… because obviously, what happened when Slovenia declared itself unilaterally independent? It broke the territorial integrity of the [Socialist] Federal Republic of Yugoslavia. Ditto when Croatia declared itself independent. Ditto when Bosnia and Herzegovina declared itself independent. And in the case of Kosovo, it’s even more, shall we say, more obvious and more crass: here, in order to obtain the separation of Kosovo from the rest of Yugoslavia, from Serbia, NATO actually carries out an illegal use of force, bombs the hell out of Belgrade and the hell out of Serbia in order to destroy the territorial integrity of a European State. It’s absolutely surrealistic how anyone could say that territorial integrity is sacrosanct when the Europeans themselves and NATO itself destroy the territorial integrity of European country. So, I don’t want to hear about that. I mention all of that in my report. And what’s important in my report – it’s A/69/272. What’s important in the report is that I develop 15 criteria “who?”, “what?”, “when?” How can you invoke the right of self-determination? What are the consequences? Who may invoke the right of self-determination and what are the obligations that ensue for the international community to help that country be incorporated into the international community as a functioning democracy that respects human rights? And I see absolutely no problem for an independent Catalonian state if indeed that is what the Catalans want. I am not a Catalan. So, if they want to hold a referendum and a majority wishes to separate, that is their good right and I will respect it. If a majority wants to remain within Spain, so be it. But it is essentially a decision that belongs exclusively to the people of Catalonia. Epithets and neologisms are flung about all the time in the political debate. It’s… When you dislike someone you call them a “populist”. And then if the government dislikes you, they will call you a “terrorist” or an “insurgent” or something of that nature. So as to, you know, put an odium on you. I mean, there is nothing wrong with being a patriot, there is nothing wrong with loving your country. I mean, I am thinking of a poem by Rainer Maria Rilke, called “In dubiis”, meaning “In doubt”. It’s a wonderful poem in which he… The first three strophes is totally cosmopolitan and “the world”, etcetera etcetera. And how does it end? He says he doesn’t bow to flags unfurled, he doesn’t bow to these ideas of patriotism. He will fight for his community. He will fight for his family, for his people. That is his kind of patriotism. So, there is nothing wrong with that.That’s actually very healthy. Because only if you love your homeland, only if you love Catalonia or you love Spain, will you work constructively for it. And it is unfortunately this culture of fear, this culture of “what if?”, that prevents progress in the relations between peoples. And I can only wish the Spaniards, Madrid and Barcelona, that, with time, they will reach a compromise that will satisfy the desires and the needs of all Spaniards, whether Catalans or Basques, or Galicians, or Andalusians. Voor deze video en de hieraan gerelateerde video’s, volg de verwijzingen op mijn website pagina “Six:Catalunya”. Voor de transcriptie van de Engelstalige tekst, zie het parallelbericht op dit weblog. De Catalaanse Kwestie in Juridisch Perspectief. 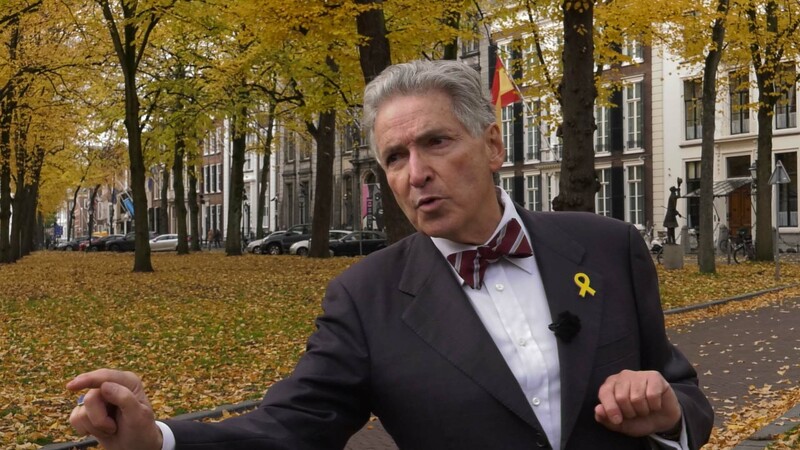 Interview met professor Alfred De Zayas, vooraanstaand deskundige op het gebied van mensenrechten en internationaal recht, voormalig onafhankelijk rapporteur aan de Hoge Commissaris voor de Mensenrechten en de Rechtvaardige Internationale Orde van de Verenigde Naties (OHCHR), voorafgaand aan zijn lezing op het symposium over het zelfbeschikkingsrecht van Catalanen georganiseerd door ANC Nederland te Den Haag op 9 november 2018. 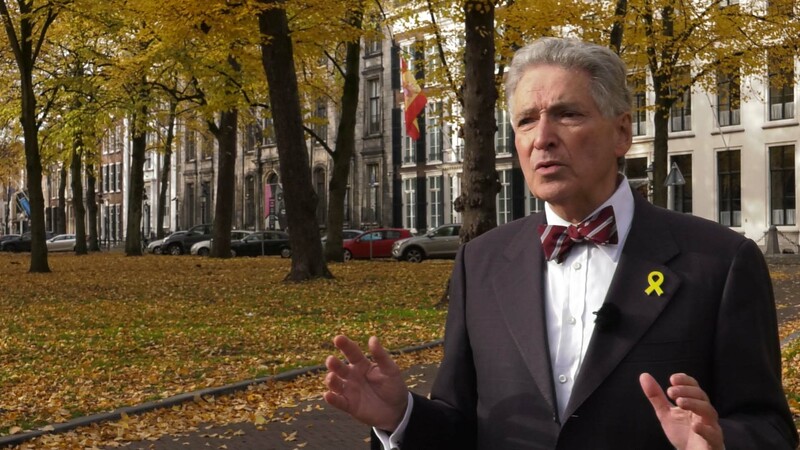 Mijn naam is Alfred De Zayas, gewezen onafhankelijk deskundige van de Verenigde Naties voor de bevordering van een democratische en rechtvaardige internationale orde. Ik heb in zes jaar, van 2012 tot 2018, 14 rapporten gepresenteerd aan de Algemene Vergadering van de VN. Een van die rapporten, uit 2014, was geheel gewijd aan de theorie en praktijk van het recht op zelfbeschikking. Daarvóór was ik hoogleraar op vele universiteiten, in Canada, de VS, Duitsland, en Spanje. Ik was ook secretaris van de VN Commissie voor Mensenrechten. En hoofd van de afdeling “petities” van het bureau van de VN Hoge Commissaris voor de Mensenrechten. Welnu, regeringen, politici en journalisten kunnen zeggen wat ze willen. Een hoogleraar Internationaal Recht zal u echter vertellen dat het recht om te beslissen, het recht om uitdrukking te geven aan de wens tot zelfbeschikking, of dat nu intern is of extern, een fundamenteel mensenrecht is. Het is artikel 1 van het Verdrag Inzake Burgerrechten en Politieke Rechten, gelijk aan het artikel 1 van het Verdrag Inzake Economische, Sociale en Culturele Rechten. Die staan niet toevallig bovenaan. De opstellers van beide verdragen hebben zelfbeschikking geschikt als het principieel eerste recht. Zoals u weet, zijn mensenrechten universeel, onderling aan elkaar gerelateerd en van elkaar afhankelijk. Derhalve, als je het recht van zelfbeschikking schendt, dan schend je bijna onvermijdelijk ook een heleboel andere mensenrechten. Natuurlijk, als een bevolking een referendum wil houden, dan is díe uitdrukking van hun wensen beschermd door artikel 19 van het Verdrag Inzake Burgerrechten en Politieke Rechten. Het is ook beschermd door het Europees Verdrag voor de Rechten van de Mens. Dat betekent nog niet dat men bij de gratie van dat referendum ook echt meer zelfbeschikking krijgt, of het recht van afscheiding of onafhankelijkheid. Een referendum houden is vers één. Vers twee is de vraag naar de gevolgen ervan. Die gevolgen moeten stroken met de geldende rechtsorde. Het moet een proces doorlopen. En dat moet overeenkomen met internationaal recht, met mensenrechten, met het Verdrag Inzake Burgerrechten en Politieke Rechten enzovoorts. Maar te beweren dat een referendum “illegaal” zou zijn is absolute onzin. – Niettemin houden de Spaanse Justitie en regering vol dat het referendum illegaal was en meerdere mensen worden nu vervolgd wegens hun betrokkenheid. Het feit dat er nu politieke gevangenen zijn in Spanje is werkelijk schandalig. En het feit dat de Europese Commissie in Brussel en het Europees Parlement dit niet luid en duidelijk hebben veroordeeld is óók schandalig. Ze zijn daarmee eigenlijk medeplichtig geworden aan een grove schending van internationaal recht, het recht inzake de mensenrechten en in het bijzonder van artikel 9 van het Verdrag Inzake Burgerrechten en Politieke Rechten. Wat betreft de betrokken personen die momenteel gevangen zitten in Spanje: hun enige “misdaad” is de uitoefening van een dwingend recht, te weten, dat van de vrijheid van meningsuiting, met het oogmerk om een referendum te houden eom dát te verkrijgen waar alle mensen recht op hebben. Artikel 1 van het Verdrag Inzake Burgerrechten en Politieke Rechten stelt dat “alle volken” , niet “sommige volken”, of “slechts die volken die onder koloniaal gezag zijn geweest”, maar “Alle volken bezitten het zelfbeschikkingsrecht.” Mijn collega aan de universiteit van Genève, professor Nicholas Levrat, die hoofd is van de vakgroep Internationaal Recht van die universiteit, heeft vorig jaar een boek onder zijn redactie doen verschijnen onder de titel “Het Recht om te Beslissen”. En daarin zijn de parameters van het recht op zelfbeschikking uitgelegd, beter dan waar ook, en in het bijzonder in het geval van Catalonië. – “Alle volken bezitten het zelfbeschikkingsrecht.” Maar wat is een “volk”? Er is geen onbetwiste definitie van een volk. In een artikel dat ik een paar jaar geleden heb gepubliceerd, en in mijn rapport aan de Algemene Vergadering van de VN van 2014, loop ik de verschillende definities van “een volk” na. De meest geaccepteerde definitie is de zogenaamde “Kirby” definitie. Kirby was een Australische rechter die in zijn betoog objectieve en subjectieve elementen van “een volk” onderscheidde. Objectieve elementen zijn natuurlijk zulke dingen als gemeenschappelijke geschiedenis, gemeenschappelijke cultuur, taal en etnische groep. Maar er is ook het subjectieve element van “de identificatie”. Wanneer je voor een groep alle elementen bij elkaar hebt, dan heb je te maken met “een volk”. En de personen die tot dit volk behoren hebben het recht om hun eigen toekomst te bepalen. Dat is de essentie van het zelfbeschikkingsrecht. Ze kunnen niet alleen besluiten tot een bepaalde mate van zelfbestuur, tot de een of andere vorm van federalisme of tot onafhankelijkheid, maar ze kunnen ook de aard van hun regering bepalen, bijvoorbeeld, en dat van het onderwijs van hun kinderen. De definitie van “een volk” kan dus geen belemmering zijn van de toepassing van artikel 1 van het Verdrag Inzake Burgerrechten en Politieke Rechten. Ik bedoel, ik heb er geen enkel probleem mee om te stellen, als professor van Internationaal Recht, dat het Catalaanse volk ook écht “een volk” is. En dat geldt niet alleen voor de bevolking van Catalonië, dus voor de mensen die nu in Catalonië wonen, het gaat op voor allen die zich identificeren met de Catalaanse taal, de Catalaanse geschiedenis en de Catalaanse cultuur. – Over het toegevoegde subjectieve element van de identificatie als “een volk”, is dat te rijmen met het begrip van “burgerschapsnationalisme”? Ik weet niet wat u precies bedoelt met “burgerschapsnationalisme”. We zijn allemaal Europeanen. En we zijn allemaal gehouden aan het Europees Verdrag voor de Rechten van de Mens. Krachtens artikel 10 paragraaf 2 van de Spaanse grondwet, is het internationaal-rechtelijk verdragsregime inzake mensenrechten in de Spaanse grondwet geïncorporeerd. Dat geldt dus óók voor artikel 1 van het Verdrag Inzake Burgerrechten en Politieke Rechten. Het is dus dom van Spaanse professoren om te beweren dat de Spaanse grondwet een referendum zou verbieden, of dat de Spaanse grondwet het recht op zelfbeschikkiing niet zou erkennen. Natuurlijk doet de grondwet dat wel! En de vraag is: hoe gaat men dat recht toepassen op een manier die vreedzaam en democratisch is? – Hoe kan Catalaanse zelfbeschikking in praktische en politieke termen worden gerealiseerd? In een beschaafde situatie, zou je onderhandelingen krijgen, tussen zij die interne zelfbeschikking nastreven en zij die liever externe zelfbeschikking zien. Wat nu vooral schokkend is, is dat de wens tot zelfbeschikking, de uitdrukking ervan, is gecriminaliseerd. En dat politici die hebbenn gepleit voor zelfbeschikking in ballingschap zijn gedreven of gevangen zijn gezet. Beeld je eens in hoe de wereld zou hebben gereageerd als de voorstanders voor de onafhankelijkheid van Schotland door het Verenigd Koninkrijk in de cel waren opgesloten. Of als de onafhankelijkheidsstrevers van Quebec door Canada gevangen zouden zijn gezet. Het is eenvoudigweg schandelijk dat er politieke gevangenen zijn in Europa, in Spanje, en dat de Europese Commissie er niets aan doet! De Europese Commissie wil de lidstaten graag op de vierkante milimeter reguleren. Ze bemoeien zich met de zaken van Polen, met de zaken van Slowakije en met die van de Tjechische Republiek. En ze roepen “overtreding!” vanwege de een of andere bedreiging van de rechtstaat in Polen of in Hongarije. Maar ze zijn oorverdovend stil over wat gaande is in Spanje, waar het vele malen erger is. Wat me dat zegt? Internationaal recht wordt à la carte toegepast, willekeurig naar believen. En welke gevolgen heeft dat? De geloofwaardigheid van de Europese Unie is in het geding. De geloofwaardigheid van de Europese Commissie, van het Europees Parlement. Het gaat niet alleen maar om de afbraak van de rechtsorde in Spanje. Het is de afbraak van de geloofwaardigheid van de organisatie die de mensenrechten van alle Europanen moet waarborgen en beschermen, inclusief die van de Catalanen. Zoals ik al zei, we hebben hier te maken met veel willekeur. Het is een willekeurige toepassing van internationaal recht en van recht inzake mensenrechten. Het is ook een willekeurig concentratie van aandacht op bepaalde landen zoals Hongarije. Het is politiek correct om Victor Orban te bekritiseren, maar het is niet polityiek correct om kritiek te hebben op bijvoorbeeld premier Sanchez. Er zijn hier dus verschillen die we niet rationeel kunnen verdedigen. Wat ik zou willen zeggen in deze context van selectiviteit is dat Europeanen, en dan vooral de meer machtige staten, bezorgd zijn over het precedent dat Catalonië voor hen zou kunnen scheppen. De Fransen zijn bezorgd over de Bretons en ze maken zich druk over de Corsicanen. De Italianen zouden kunnen vrezen dat de Veneto zich zou willen afscheiden. Of dat de Lombarden dat zouden willen doen, of de Duitstaligen van Zuid-Tirol. De Vlamingen zouden zich willen afsplitsen van België. En dan zeg ik: als ze zich willen afscheiden, zou het een vriendschappelijke scheiding dan niet veel beschaafder zijn? In 1993 zijn de Tsjechen en Slowaken uiteen gegaan en ze hebben sindsdien beiden perfect functionerende democratische samenlevingen en regeringen. Er is geen probleem. Welnu, er zijn 7,5 miljoen Catalanen. Volgens de Montevideo Conventie zijn de elementen van een staat als internationaal erkend rechtspersoon de volgende: een bevolking; een territorium; een regering – 131 presidenten van de Generalitat van Catalonië; en natuurlijk betrekkingen met andere internationale entiteiten. Catalonië heeft al die elementen. En het is een levensvatbare staat, met 7,5 miljoen mensen, een levendige bedrijvigheid en een zeer, zullen we zeggen, bloeiende bevolking. Het zou een perfect functionerend onafhankelijk land in de Europese Unie kunnen zijn. Maar de precedent-werking is hier de beperkende factor en de Europeanen, vooral de Fransen, zijn bang. – Hoe gezaghebbend en onveranderbaar is een grondwet als zou blijken dat die op sommige punten strijdig is met internationaal recht? Geen enkele grondwet is in steen gebeiteld. Ik bedoel, alle constituties zijn onderhevig aan verandering. En in het geval van Catalonië gelet op zelfbeschikking zou je de Spaanse grondwet niet eens hoeven te veranderen, omdat zelfbeschikking, krachtens de twee voornoemde artikelen 10 paragraaf 2 en 96, reeds deel uitmaakt van de Spaanse rechtsorde, net als van de rechtsorde van alle andere Europese Unie lidstaten. Dus als de Catalanen een referendum willen houden en als ze dan onafhankellijkheid willen, dan hebben ze het recht daartoe. Nu is het zo, dat het algemeen publiek neigt naar de handhaving van de “status quo”. Laat de dingen maar zoals ze zijn. Zet niet alles op de wip. Deze neiging tot conservatisme kan worden aangepast en verzwakt met wat goede wil en enige medewerking van de media. Het is me opgevallen dat de berichtgeving over Catalonië in El País, El Mundo en ABC in Spanje. in Le Monde en Le Figaro in Frankrijk, in de Neue Zürcher Zeitung en Die Weltwoche in Zwitserland, enzovoorts … dat die behoorlijk vooringenomen zijn, behoorlijk eenzijdig. Daarmee zijn de belangen van de Spanjaarden niet gediend, noch die van de Catalanen of de Europeanen in het algemeen. Ik blijf het zeggen: de Catalanen zijn Europeanen. Ze zijn goede Europeanen. Ze geloven in mensenrechten en ze hebben de wereld een voorbeeld gegeven, van de wijze waarop je democratisch en vreedzaam je zelfbeschikkingsrecht kunt opeisen. Helaas wordt het onderdrukt en, om welke redenen ook, geo-economische wellicht, het wordt ook afgeremd, tegengehouden. Het wordt vertraagd omdat bepaalde belanghebbenden bezorgd zijn dat er misschien onvoorziene economische gevolgen uit zullen voortvloeien. – Over de voortschrijdende ontwikkeling van het recht op zelfbeschikking, het begrip van territoriale integriteit en het recht van afscheiding. In 2014 heb ik bij de Algemene Vergadering van de VN een rapport ingediend, een rapport dat volledig is gewijd aan de doctrine van zelfbeschikking en aan de ervaringen die de internationale gemeenschap daarmee inmiddels heeft opgedaan. Nu is het belangrijk om te weten dat internationaal recht niet statisch is. Internationaal recht is dynamisch, het is altijd in voortschrijdende ontwikkeling. En er zijn bepaalde dingen gebeurd sinds 1945 die het recht op zelfbeschikking hebben doen zien evolueren. We zitten niet meer in het stadium van de dekolonisatie. We zitten niet meer in het stadium van 1960, 1965, 1970 etcetera. We leven in de 21e eeuw, in 2018. We hebben de ontbinding van de Sowjet Unie in 15 republieken gezien. We hebben de ontbinding van Joegoslavië in 7 staatseniteiten gezien. En er is jurisprudentie geweest. Tot die jurisprudentie behoort vooral het advies van het Internationaal Gerechtshof van 2010 over de unilaterale onafhankelijkheidsverklaring van Kosovo. Daarbij gaat het niet zozeer om het feit dat een unilaterale onafhankelijkheidsverklaring een schending van internationaal recht is. Dat is vanzelfsprekend. Dus dat is niet de kern van de zaak. Dat is niet waar de aandacht op zou moeten worden gevestigd. De aandacht moet gericht zijn op de vraag: wat zijn de belemmeringen voor het verkrijgen van zelfbeschikking? En dan zal Spanje u vertellen: “territoriale integriteit!” En ze zullen u vertellen dat het principe van territoriale integriteit absoluut is. Maar op dit punt heeft het Internationaal Gerechtshof uitsluitsel gegeven. Het heeft de vraag beantwoord. Prevaleert de territoriale integriteit op de een of andere manier boven het recht van zelfbeschikking? Het antwoord is “nee”. Maar het Internationaal Gerechtshof gaat verder dan dat. Het zegt, met het Handvest van de Verenigde Naties, artikel 2, artikel 4, met resolutie 2625, met resolution 3314, met de Verklaring van Wenen en het Actieprogramma van de Wereldconferentie inzake de rechten van de mens in 1994, met de Millennium Declaration, en zelfs met de Organisatie voor Veiligheid en Samenwerking in Europa (OVSE) die zijn beslag kreeg in Helsinki in 1975: wanneer beroep wordt gedaan op het principe van territoriale integriteit, dan wordt dat gedaan in de context van de betrekking tussen staten. Met andere woorden: Staat A mag geen inbreuk maken op de territoriale integriteit van Staat B;Staat A mag het territorium van Staat B niet bezetten; Staat A mag Staat B niet aanvallen. Nooit, echt nóoit, kan het het principe van territoriale integriteit intern worden gebruikt. Want dat zou onmiddellijk het zelfbeschikkingsrecht vernietigen. Het zou het recht van de Slovenen op hun onafhankelijkheid vernietigen. Want, ga maar na, wat gebeurde er toen Slovenië zichzelf unilateraal onafhankelijk verklaarde? [in 1991] Het verbrak de territoriale integriteit van de Socialistische Federale Republiek Joegoslavië. Hetzelfde gebeurde toen Kroatië de onafhankelijkheid uitriep. En hetzelfde gebeurde ook weer toen Bosnië en Herzegovina zichelf onafhankelijk verklaarden. En in het geval van Kosovo ligt de zaak, zullen we zeggen, nog duidelijker, nog grover. Want om de afscheiding van Kosovo van de rest van Joegoslavië te bewerkstelligen, heeft de NAVO hier feitelijk onwettig geweld gebruikt. Door met zware bombardementen op Belgrado en elders in Servië de territoriale integriteit van een Europeese Staat te vernietigen. Het is absoluut surrealistisch om te zien hoe men kan zeggen dat territoriale integriteit heilig is, terwijl de Europeanen en de NAVO zélf de territoriale integriteit van een Europees land vernietigen. Dat wil ik dan verder ook niet meer horen. Ik bespreek dit alles in mijn rapport. En wat belangrijk is in mijn rapport– het gaat om A/69/272 – Het belangrijke van mijn rapport is dat ik 15 criteria onderscheid– wie, wat wanneer … Hoe kun je beroep doen op het recht op zelfbeschikking? Wat zijn de gevolgen? Wie mag beroep doen op het recht op zelfbeschikking? En wat zijn de verplichtingen die daaruit volgen voor de internationale gemeenschap om dat land te helpen opgenomen te worden in de internationale gemeenschap als een functionerende democratie die de mensenrechten respecteert? 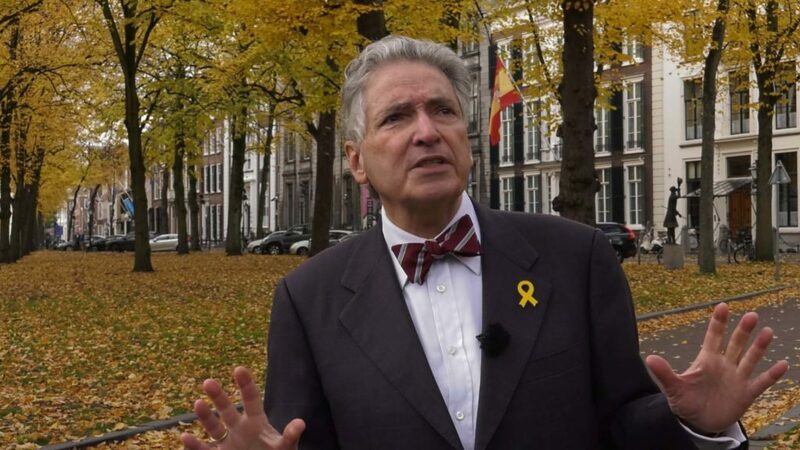 En ik voorzie geen enkel probleem voor een Catalaanse staat als de Catalanen die inderdaad zouden willen hebben. Ik ben geen Catalaan. Maar als zij een referendum willen houden en een meerderheid wil zich afscheiden, dan is dat hun goed recht en ik zou het respecteren. Als een meerderheid bij Spanje wil blijven, laat het dan ook zo zijn. Maar het is in essentie een beslissing die uitsluitend door het volk van catalonië kan worden genomen. Schimpnamen en neologismes vliegen je continu om de oren in het politiek debat. Als je aan iemand een hekel hebt, dan noem je hem of haar “populist”. En als dan de regering een hekel aan je heeft, dan noemen ze jou een “terrorist” of een “opstandeling” of iets dergelijks. Om je zo een blaam op te leggen. Kijk, het is niet verkeerd om een patriot te zijn, om je vaderland lief te hebben. Ik denk hierbij aan een gedicht van Rainer Maria Rilke, “In dubiis” genaamd. Het is een prachtig gedicht waarin hij … De eerste drie strofes zijn totaal cosmopoliet met nadruk op “de wereld” en zo – en hoe het dan eindigt? Hij zegt dat hij niet buigt voor ontplooide vlaggen. Hij buigt niet voor dergelijke ideeën van patriottisme. Hij zal vechten voor zijn familie en voor zijn volk. Dát is zijn soort van patriottisme. Er is dan ook niets mis mee. Het is eigenlijk heel gezond. Want alleen als je je thuisland lief hebt, alleen als je Catalonië lief hebt of Spanje, zul je je er constructief voor inzetten. Het is helaas deze cultuur van angst, de cultuur van “wat als?”, die vooruitgang in de betrekkingen tussen volkeren belemmert.En ik kan alleen maar wensen dat de Spanjaarden, Madrid en Barcelona, mettertijd een compromis bereiken dat de wensen en behoeften van alle Spanjaarden vervult, of ze nu Catalanen zijn of Basken of Galiciërs of Andalusiërs.